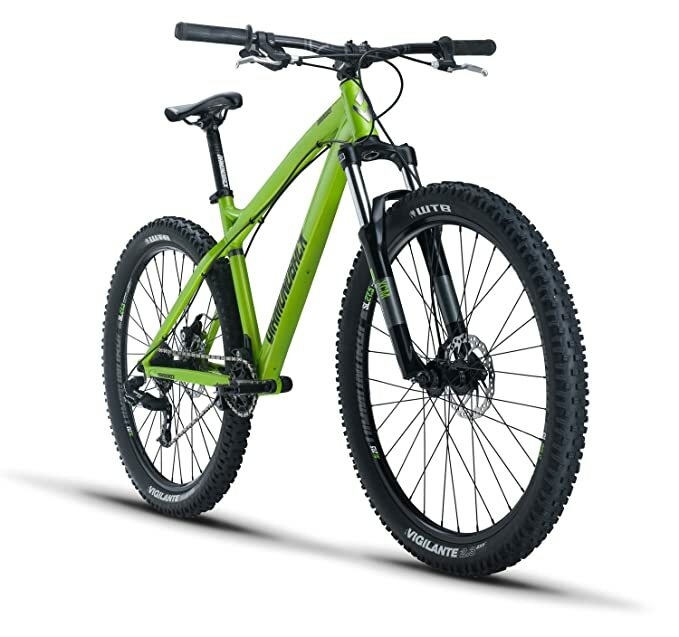 Review of Diamondback Hook 2019 - Why Its Best Hardtail? Are you look after a mountain bike that’s made for beginners? After extensively researching the Diamondback Hook mountain bike, we discovered it to be an excellent choice for newbies who are looking to start trail riding. It is packed full of incredible riding features that enhance the experience of mountain biking. All of these parts comes together to provide you with an outstanding bike that’s available for under $1,000! To learn everything, you need to know about this bike, take a quick look at our detailed review below. The Hook was designed for people who want to experience fast-paced riding with incredible amounts of responsiveness. All of the riding features combined make this bike fantastic for those who are entirely new to mountain biking. So, it’s an excellent entry-level mountain bike. What Features Diamondback Bicycles Hook Mountain Bike Offers? The suspension system is one of the most outstanding features that this bike has to offer. This is because it provides you with the ability to ride across a wide range of terrains. Regardless of how rough the trails are or how bumpy the surfaces feel, you can be sure that this bike allows you to ride smoothly. An SR Suntour XCM fork has been fitted to the DB Hook. It has an impressive 120mm travel fork. As a result, you can feel confident in relying on the suspension mechanism to keep you supported while riding on tricky terrain. While riding on challenging surfaces, a bike with poor suspension will tire you out very quickly. However, while riding on the Hook, this element of fatigue is completely removed. The bike works to absorb the shock so that you don’t have to deal with it. Therefore, you can enjoy longer rides without becoming tired as quickly. Is the frame of a high-quality? We were glad to find that this bike incorporates a frame that is both light and extremely durable. This is one of the elements that make the Hook such a fantastic mountain bike. The frame has been constructed with 6061-T6 butted aluminum materials. Therefore, you can be assured that this bike is effective at being able to withstand any potential damage from off-roading. Moreover, the geometry of the frame means that you are in a position that promotes smooth riding. So, the frame and suspension mechanism work hand in hand to let you ride on rough terrain with smoothness. This geometry also means that you’ll be able to boost your performance when it comes to trail riding. 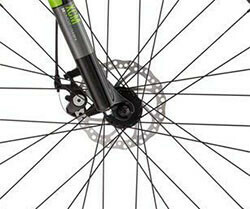 The wheelset of a bike plays a vital part in its overall performance. Since the Hook is fitted with Kenda Nevegal tires, we knew straight away that they were going to enhance the overall quality of the bike. These Kenda Nevegal tires have double-walled rims on the inside which provides them with an incredible sense of stability and support. As far as the tires themselves, we were impressed by how they have been created specifically for trail riding. We noticed that the amount of traction they provide you with has a massive effect on how fast you can ride without skidding. 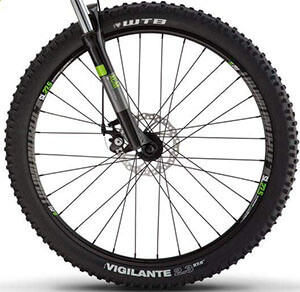 The wheels are 27.5 x 2.35” in size, which means they are a fantastic width for off-road riding. They provide you with a lot of stability to allow you to ride at faster speeds and get the most out of your riding experience. When it comes to mountain biking and riding across rough terrain, having a wide range of gear options is crucial. 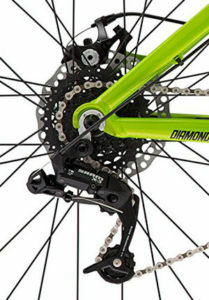 The DB Hook features some high-quality SRAM parts which make it a pleasure to ride on off-road conditions. You are given a total of eight gears to choose from. As a result, you can be sure to pick the right one depending on the riding circumstances. No matter whether you’re going uphill, downhill, or riding on a flat surface, you have the gear options you need to enhance your riding experience. Moreover, we liked how the SRAM parts for the shifter allows you to change through the gears with an incredible amount of precision and smoothness. So, we know that this bike provides you with great gear options, a lightweight frame, and high-traction tires to ride at fast speeds. However, do the brakes keep up with the rest of the bike? For mountain biking, the brakes are especially important. Since you’re riding on challenging terrain, you need to have a reliable set of gears that work to bring you to a safe stop. The Hook comes with awesome Tektro Aires mechanical disc brakes. We found these brakes to be incredibly powerful. This is a fantastic feature that puts your mind at ease. You can enjoy the Hook more while riding at faster speeds as you know that you have a great braking system that will bring you to a safe stop. The Tektro 2-finger braking level is incredibly responsive and easy to use. As a result, you have more control over how you brake. So, you can come to gradual stops, or instant ones, all at the tips of your fingers. This is an excellent feature for beginners who are taking the bike out on trail paths for the first time. When we were reviewing all the features that this bike is equipped with, we couldn’t believe that this mountain bike available for under $1,000. Most mountain bikes of this quality are at least $1,500. This is a huge benefit for beginner riders who are also on a tighter budget. Diamondback has created a bike that’s crafted for newbies. However, they’ve made sure not to include a lot of the riding features that you can only find with higher end bikes. Question: Can the suspension system be adjusted? Answer: Yes, you can adjust the suspension to your preferences. Question: Does this bike come with any accessories? Answer: They include an owner’s manual, toolkit, and assembly guide. Question: Is the head tube tapered? Question: What’s the maximum width of tires that you can fit the Hook? 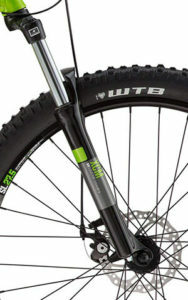 Answer: This bike can be fitted with tires that have a width of up to 2.5”. Answer: The DB Hook weighs around 32 lbs. DB delivers this Hook bike to you in a state that is 85% assembled. We appreciated this as it means people who are new to mountain bikes won’t have to know too much about how to put a bike together. The only parts that need assembling include the seat, handlebar, and front wheel. They include some easy-to-follow instructions that make the entire process easier and quicker. Having said that, if you don’t feel comfortable doing it for yourself, you can always take it down to a local bike shop. They’ll assemble and tune the bike for you. Although, it will come at an extra cost. 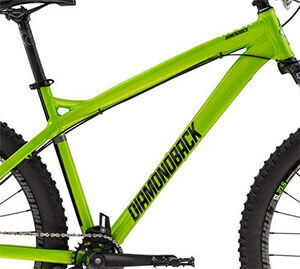 Overall, Diamondback Hook bike is a lightweight, strong, fast, and safe bike. All of those features are exactly what you want to find with a budget mountain bike – especially if you’re a beginner. It’s affordable yet manages to perform incredibly well on trails and off-road terrain. Be sure to use all of the details that we’ve provided above to help you make the best decision!